I despise inspirational memes, and quotes. Whether they be on mugs, or on your wall, I’m a horrible, miserable, old cynic. For this I will make an exception. The Skeletor Live Laugh Love Pin Badge on Chaotic Bats’ Etsy Store. I actually have a Castle Grayskull perched in my hall, under the stairs, so if there was a print to go along with this I might end up with a ‘Live, Laugh, Love’ framed atrocity in my own home after all. What’s the Weirdest Thing You’ve Ever Found in a Supermarket? - A Pineapple Plant in Asda- It Claims to Help Sleep Apnea & Snoring! I was in Asda in Bangor just before Christmas and I spotted amongst their Christmas florals, a rather unusual plant. Not the usual poinsettia, but a gold pot that looked like my 1970s’ plastic pineapple, with an almost fake looking type plant on top, and then as I got closer, a literal tiny pineapple on a stick perched in the middle. Turns out this is what an actual pineapple plant looks like. Given as I am from Northern Ireland, I hadn’t seen one before! I could as easily imagined them growing like coconuts on trees. I certainly have tried growing absolutely everything else in my greenhouse, even watermelons, and bananas, unsuccessfully of course, but even I knew I couldn’t get a pineapple going. The pineapple plants were decorative Christmas gifts and only £10. I was going to ask someone to buy me one, but already there were only a few left, so I just picked one up for myself that day with the groceries I was getting. I was in again before the 25th and they were all gone, so I’m not sure if they will be bringing the pineapples back in for a year round gift, but they did seem to be extremely popular, so if they sold them in spring they could still sell I would imagine. I would love to see other unusual plants sold too. The little tag with the pot said that because the plant produces oxygen at night, it can help reduce snoring, and help with sleep apnea. I wonder will I be able to grow a full size pineapple? I remember as a child always being intrigued when on visits to Texas, the predecessor of Homebase, by the fake props they would have to stage the pretend living rooms and bedrooms. The false televisions, the plastic video players and fake books, all staging to help you imagine their sofas and tables they were selling for your own rooms back home. IKEA does the same, but with their wider range of products they can stage more realistic rooms with their own products from other departments, so you can picture a more homelier home. We were browsing the children’s department in IKEA Belfast back in the autumn when I spotted something that looked out of place, a book that was older than the usual books placed in the kids’ bedrooms. It was in what I assume is Swedish and appears to be an educational book from the 60s or 70s. The illustrations are similar to the Childcraft English language educational books that I collect. I thought I would share them here, as they are after all very kitsch. Maybe next time you are in IKEA Belfast you can see if you too can spot this mysterious book in the Kids’ Department. #MyMarksFave The Hashtag You’ll See in Your M&S Store Pointing Out Celebs’, & Staff Members’ Favourite Christmas Treats - I Share Mine Too! There is one thing we know to be true about braving the busy stores these last two weeks of Christmas shopping, M&S is going to be crazy, but if you want the best treats, you gotta withstand the heat! M&S is home to the proper party food of Christmas. Please don’t be offended, other brands and supermarkets I blog with, but everyone knows, when it comes to your Boxing Day Buffet, your New Year’s Spread, Marks and Spencer party food is just like flying first class. Yes you could get a sausage roll elsewhere and it would make do, but why, when you could get a mini-kiev? Or Thai Fishcake? Or vegan burger even though you aren’t even vegan but want to be a bit fancy and try one? That means M&S is busy - but you better believe your trip is worth it. Even better, right now M&S Party food is mix and match 4 items for the price of 3, which extends to desserts too, such as mini cupcakes. While you’re browsing in store you may spot some little recommendation tags beside the price tags of some products, marked with “#MyMarksFave” These are dishes handpicked by a tester team of lucky celebs who got to try out the Christmas range and recommend their favourites from the selection. I picked up the Truffle Mayonnaise, which is recommended by Amanda Holden, and it’s only £2.50 a jar (very top photo). The M&S Cranberry is only £1 this week, so if you love that with your turkey you could stock up now. There’s also Turkey Gravy, ready to serve. My local Bloomfields, Bangor Store also has Paddy McGuinness’s #MyMarksFave which is the Santa Hat Profiteroles. They are £5 for a sharing size dessert portion and are very cute. You’ll also see recommendations made by staff members from your own M&S store on what they love to eat at home. The Christmas desserts from Marks and Spencer are always wonderful, so #MyMarksFave is in fact their desserts to order. There are only two days left to place a Christmas Food To Order order, however, I always find with the dessert I book yearly, when I do go to collect it on Christmas Eve, they are also selling them in store on the day too, on the shelves. So if you are reading this after the 15th of December and it’s too late to book a dessert in store, or online, don’t despair, you can try in M&S the few days before Christmas, they usually have the fresh desserts then to buy. Of course there are a wide range of other desserts to choose from to order (click any pic below to enlarge) as well as cheeses, and all the usual savoury Christmas food, and party food. Closing date is 15th Dec so be quick. There is a very good range of party food in store now if you want to buy all your Christmas goodies now and avoid those crowds of the last week and last few days leading up to the 25th December. The dates on the party food will be short dated to go ‘out of date’ before Christmas, however, most of the party food can be frozen on date of purchase. Even the smoked salmon blinis can be frozen and then thawed out for the big day, so technically you could go and buy all your Christmas party food now while the shops are quite so crazy, freeze it, and be all ready for Christmas when it comes. The party food range is as amazing as ever this year, with old favourites like the mini burgers, and additions like a vegan burger option. The Asian Chicken lollipop favourite is back, lots of kid friendly favourites like sausage rolls, pigs in blankets, and the mini pizza platter which my son will demolish I’m sure. There are plenty of vegetarian options, but I also spotted Wheat-Free party food this year for the first time (I think) so M&S really is catering to everyone this year. My Mum is a big fan of the Indian snack party food, and I love how delicate the new wok-toasted sweetcorn cones look in the 12 piece oriental vegetable selection. All the party food shown here is priced at either £5, or £7, and are all part of the 4 for 3 deal. The Santa plates are also available from M&S from the Food Hall and are only £2, I thought they were so cute! 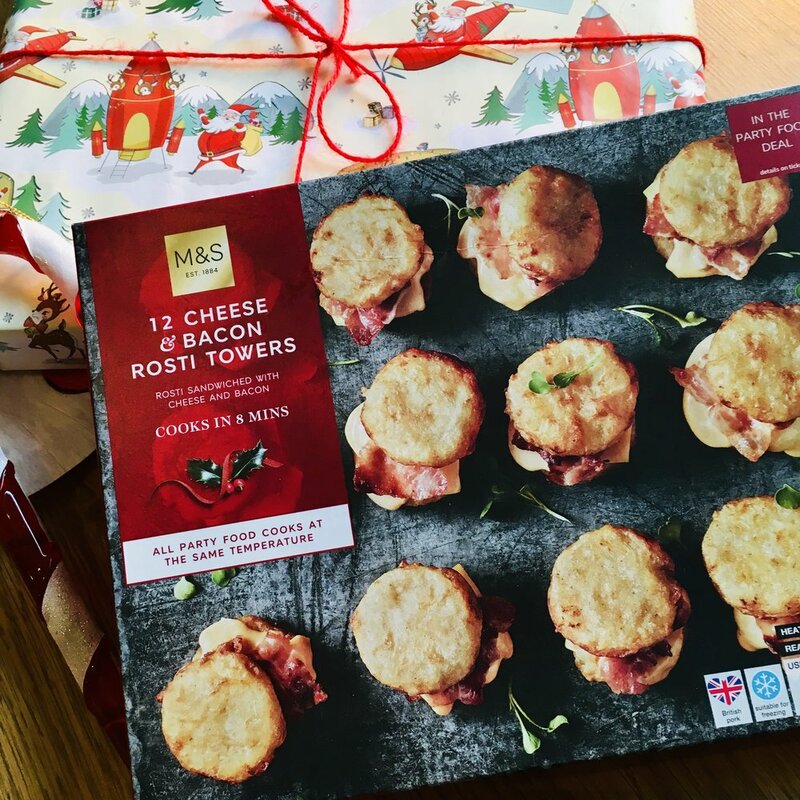 Finally, and forgive me if this is a total faux pas in a blog post about food, but after I was picking up the blog post items, I had to go buy two packs of M&S’s super adorable Christmas loo roll. It’s £2.50 for four, which is a great price, and it’s covered in little reindeers and Santas. I’m just a sucker for novelty and I couldn’t resist! It’s my dream one day to live in a little house, even a tiny one bedroom place, but somewhere that has a name. When I was tiny we would go to the Isle of Man and stay in a place called Rose Cottage, maybe it’s a throwback to that. I also have often coveted the hand-painted signs that people have on those houses, especially on our North Coast. The ones with wild flowers or squirrels. So when U.K. Sign Shop asked me would I like to review their service, and pick a sign in return, I said of course. The site has a live preview option, which means you enter your house number and street name and can see exactly what the sign will look like, the spacing etc. So it won’t be a surprise how it looks and you can change it before it’s printed. You can see which of the signs will look most aesthetically pleasing with your street name or house name, before it even printed up. They also have a seven day money back guarantee however, if you aren’t happy with the finished product. There are 30 slate designs to choose from, 33 acrylic, 3 wood, 7 aluminium, 4 corian & 5 resin. You can play around with the designs as much as you want in the live preview before submitting the final product for digital printing. Sign prices start from £6.49, so there is a wide range of styles and price ranges to choose from. There are also business signage options available, wall art and wedding signs. I chose the ‘Robin Way’ slate sign, which has 25% off right now and is £24.99. I’ve yet to get it put up, as the weather has been dreadful, but I’m so happy with how it’s turned out. (I’ve edited the picture to remove the text so my house number can’t be read.) The slate itself is very thick & good quality, the print is crisp and colours bright and clear. If you are super quick, shipping today, 5th December, is free, it’s usually £4.99 and if you order before the 10th December they guarantee Christmas delivery, so it could be a good present for someone who really has everything, but would love a fresh new look for welcoming people through the door. If it’s after 10th December, it’s not too late to think about revamping your home for a brand new year, and that can start with the outside too. These signs will last for years to come, so why not start 2019 with a fresh face for your home too? Visit UK Sign Shop and use their live preview with your house number to see what your personalised sign could look like. Spar NI Expand Locally-Made The Kitchen Range With More Desserts, Do You See Any Of Your Favourites? Spar NI’s The Kitchen range is still fairly new, launching in late 2016, but has proven popular, thanks to the fresh ingredients & locally sourced products, meaning better quality ‘quick cook’ meals than competitors. They did have a couple of dessert options in the range, I think there were three that I can think of, but going into 2019 they’ve just expanded the line to include some more after dinner delights, ready for the oven that will taste like you baked them up yoursef at home. There are the Chocolate Profiteroles which are always a favourite in this house. There’s two different types of crumble, Bramley Apple, and Rhubarb. Next up is a very tempting Sticky Toffee Pudding, which was part of the original The Kitchen range, but this has had a revamp and is larger and more cake like. There’s a classic Rhubarb Tart, and lastly Bread and Butter Pudding. Everything apart from the Profiteroles can be frozen on the day of purchase if you wish. Again apart from the Profiteroles I would say the other desserts would be able to be split between a family of four for Sunday lunch, just add custard or ice cream and you are all set. You’ll find The Kitchen range in larger Spar NI stores and Euro Spar locations. If you read The World of Kitsch you will know the scarves of Karen Mabon by now, and if you follow my Instagram you’ve definitely seen me wearing a few in my stories. I’ve actually lost count of how many I have, as I’ve some that I wear, obviously as intended, but I also have a couple I bought to frame. Like the special Freud Museum print trio, and Karen’s special limited edition, annual calendar silk handkerchief, if you’re lucky you can catch a couple of these on the store at the end of the year if you are on her mailing list. The scarves depict different breeds of cats dressed up, one a shark, a pumpkin, a pirate, a princess. The dog scarf is equally adorable, with a Yorkie jester, a Pug wizard, a Labrador frog prince, a Sausage Dog dressed as Superman, and my favourite, with bias of course because of my relation to ‘Weird Judy’ who you would also know from my Instagram, a Wire Fox Terrier dressed as a lobster. Karen’s 2018 Christmas Collection consists of four scarves, and Ms. Mabon has brought back our fancy dress friends in some Holiday costumes and they are just as wonderful as the original scarves. Christmas Cats (shown above) HAS to be my favourite, the Santa Cat looks a bit like my Mrs Meow, if it was scowling a touch more. I love the candy cane trim too, it would look very smart when worn, even if the design wouldn’t be showing then. I think if I was wearing this scarf I would have it on and off my neck half a dozen times an hour to show people the design! More of a Pup Person? The Christmas Dogs Scarf, like the Christmas Cat Scarf is 100% silk and both measure 55cm x 55cm. Look at that pudding Pug. Who knew a day would come when you could buy a luxury Italian silk scarf with a Corgi on it, in the fancy dress costume where it’s made to look like two dogs carrying a box. What a time to be alive. There’s even a Poodle dressed as Santa. The Christmas Fancy Dress Scarves are both limited edition, and unlike the original Fancy Dress prints, I would hazard a guess that there won’t ever be reprints on these, and they WILL sell fast. If you want one, buy one now. Two scarves are more conservative with a classic wreath design, in either Jet Black 100% Italian silk, or beautiful jewel tones of jade and Teal Silk (both shown above beside the original Fancy Dress Dogs Scarf, click on them to enlarge to see the design clearly). They measure 55cm x 55cm so they can be given as a gift to either a man as a pocket square, or a woman as a scarf. You can tie the scarf loosely on your handbag handle to show off the seasonal print. Karen even suggests displaying it in place of a traditional wreath. Every scarf in the Holiday Collection is priced £75 and during November shipping is completely free, worldwide, so get your present buying completed early! Even if it’s a little something for yourself! Could Your Child Be An Ikea Toy Designer? Enter The New 2018 Sagoskatt Competition Now & Buy Last Year’s Winners’ Plushies In Store Now to Help Support Barnardos. The limited-edition SAGOSKATT soft toy collection is back, and it’s packed full of colourful characters ready to join playtime. Ikea’s annual, soft toy drawing competition attracted 87,000 entries from children around the world, and they’ve made a handful of them into real-life toys. I’ve blogged about this a few years now, and I always love to see the winners. It’s so cool seeing a child’s drawing brought to life, from the sketch to the completed toy on the shelves. This year’s IKEA soft toy drawing competition is open now – so it’s time for your kids to get creative. They can sketch own soft toy for the chance to see their invention made into a real toy next year. The competition is open to all IKEA FAMILY members’ children aged up to 12, until November 13. So you need to be quick and visit today or tomorrow and pop your sketch in the box which is in the kids’ section of the store. If you aren’t a Family Member, just ask to sign up with a member of staff, it’s just like having a Tesco Clubcard or Boots Advantage Card, so it’s very simple. The most unique creations will be turned into real soft toys to be sold in every IKEA store and to inspire kids’ play across the world. If you are reading this after the 13th of November, don’t despair, the cute toys will still be on sale. They all cost £4.75 each and Ikea donates the VAT to Barnardos. You can read all about the Sagoskatt competition and more on the Ikea website.